The eighth edition of the European Darts Open was played from 22 to 24 March. The Ostermann Arena in Leverkusen is the host for the third time. In 2019, the European Darts Open is the first EuroTour tournament of the year, which means that almost all the big names are present. 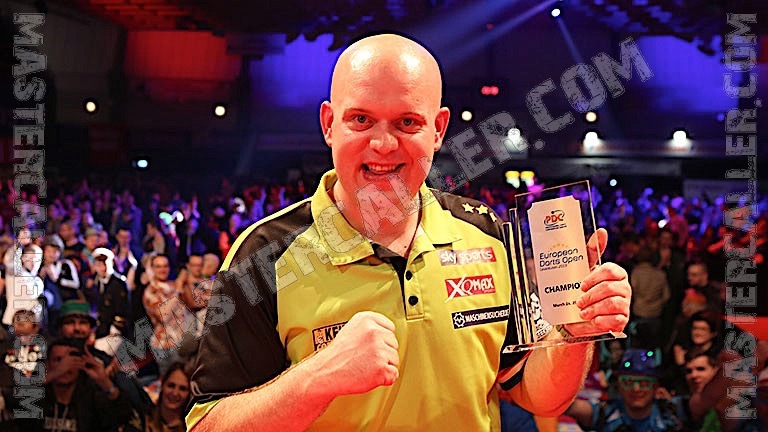 The title is for the second year in a row and for the fourth time in total for Michael van Gerwen. He beats Rob Cross in the final 8-6. Van Gerwen easily defeats Mervyn King and Jermaine Wattimena with 6-1 and 6-0. In the quarterfinals against Gerwyn Price the Dutchman survives a match dart from the Welshman, a round later Van Gerwen trails again against Mensur Suljovic, but a nine-darter turns that game around in favour of Mighty Mike. Rob Cross plays a very convincing tournament. Steve Beaton, Jonny Clayton, Justin Pipe and Peter Wright are all beaten with an average of over 100. In the final, Cross also plays excellent, but Van Gerwen still wins 8-6. For Van Gerwen it is already his 29th victory on the EuroTour. Rob Cross plays his third EuroTour final in Leverkusen, but for the third time in a row Van Gerwen is the man who beats him. The nine darter by Mighty Mike is the eighth in the history of the Euro Tour, the last was in 2018, also by Van Gerwen.